One of my Christmas presents last year was a poppy lapel pin. It is made from British shell fuses fired during the Battle of the Somme. It also includes finely ground earth from places inextricably linked with those months which, for many, define the Great War: Gommecourt, Hebuterne, Serre, Beaumont Hamel, Thiepval, Ovillers, La Boiselle, Fricourt and Mametz. Places which are still etched in the minds over a century later. 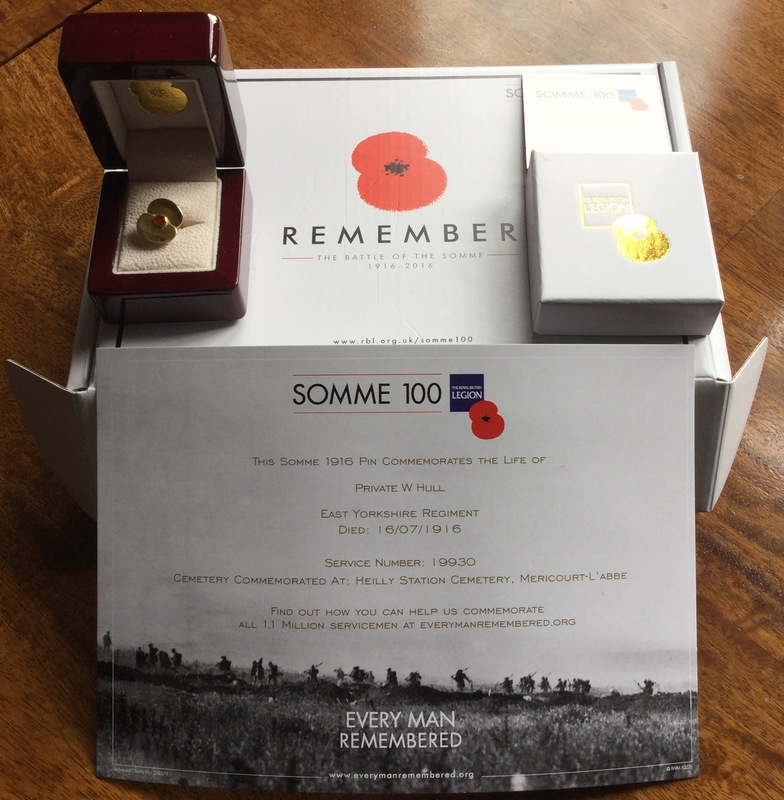 Importantly for me the poppy was accompanied by a certificate commemorating the life of a soldier who fell during the second to the 141st (and final) day of the Battle. My wish was to research his life and record it on the “Every Man Remembered” site. It did not work out quite as anticipated. I researched more than one life, in what proved to be a series of deaths which in a matter of months devastated a London family. But this family’s story is similar to stories repeated up and down the country. The name on the certificate was Pte W Hull, 19930, of the East Yorkshire Regiment who died on 16 July 1916. He is buried at Heilly Station Cemetery, Mericourt l’Abbe, located 10 kilometres south west of Albert. The Commonwealth War Graves Commission website indicate he served with the 1st Battalion, but give no family details. The cemetery was the scene of intense activity during the Battle of the Somme, as indicated by the multiple burials marked by many of the headstones. Begun in May 1916, it provided the base for a number of Casualty Clearing Stations. From April 1916 the 36th Casualty Clearing Station (CCS) was located there. In May the 38th CCS joined them, followed in July by the 2/2nd London CCS. William Henry Hull’s birth was registered in Holborn, in the first quarter of 1895. His parents, William George Hull and Ann King (known as Annie), married on 28 October 1894 at St Peter’s Saffron Hill, Holborn. They went on to have four other children: Albert Edward, registered in 1897, Robert George in 1900, Annie Lydia in 1903 (born 2 February) and Charles Frederick in 1907 (born 22 September). Their address in the 1901 census onwards is 17, Northampton Road, Clerkenwell. The family are still recorded there in the 1939 Register. This was a subdivided property typical of the area, characterised by densely populated high occupancy houses, interspersed with areas of model dwellings, the latter an attempt to provide decent working class accommodation. A manufacturing area characterised by a high working class presence, Clerkenwell had a significant number of artisan metal-based crafts emanating from its early watchmaking traditions. Although watchmaking in the area suffered a decline by the end of the 19th century in the face of cheap and foreign competition, other offshoots such as scientific and surgical instrument making and barometer and chronometer manufacture had a presence. The other significant industry was printing. This strengthened its grip in the period the Hull family lived in the area. It was, in the main, centred around the printing of small periodicals, engravings, maps, books and pamphlets rather than national or London-wide daily press. And with his printing industry earnings, as a compositor setting the type ready for printing, William (senior) supported his family. William and Albert’s early jobs, as indicated in the 1911 census, were as errand boys at a photographers and barometer works respectively. By the time he joined the Colours, William worked as a liftman. He enlisted in Clerkenwell on 18 September 1915. On the 19 September he went to join his regiment. Appropriately, given his surname, he was assigned to the 3rd (Reserve) Battalion, East Riding Regiment, a training unit based at Beverley. Standing at 5’ 4 ½” and weighing 126lbs (9 stones), he had a scar on his forehead and his right upper lip, he also had “I love Jessie James” inked on his left upper arm. And he did, for he married her at Holborn Registry Office on 20 February 1916. She went on to live at 17 Northampton Road whilst William resumed his training. It was not until 14 June 1916 that he embarked to serve with either the 7th or 8th Battalion East Riding Regiment – his papers are ambiguous. However on 9 July he was posted to the 1st Battalion and joined them in the field on 10 July 1916. The Unit War Diary of the 1st East Yorkshires records it was a fine day, and notes the arrival of two drafts of men from the West and East Yorkshire Regiments, whilst they were en route to Ville via Corbie. They arrived at Ville on 11 July, in readiness for their next offensive – an attempt to break through the German second position on the line from Longueval to Bazentin-le-Petit. This was the successful Battle of Bazentin Ridge. Launched in the early hours of 14 July 1916 it lasted until 17 July by which time the German second position was captured on a front of 6,000 yards. For a while it even looked as if High Wood lay open, but delays in getting cavalry forward meant the moment was lost. “….at 3.30pm marching to Carcaillot Farm in the E. border of Meulte arriving about 5pm where rested (tea was provided) until 9pm when we moved to Fricourt (Rose Cottage) arriving at 10.30pm. Hot tea was served to the Btn and tools and grenades were issued. At 12.25am Btn moved to position in reserve at the S.E. corner of Mametz wood arriving about 2.30am where they dug themselves in. Enemy shelled borders of wood and vicinity large numbers of lachrymatory shells being used. Only one casualty in march was incurred”. “……an unfortunate incident occurred, our own artillery shelling us from the rear at the same time as the enemy were barraging the N edge of the wood and many casualties occurred”. “No 2278 Sergeant Gillbee RAMC placed under arrest for drunkenness”. Gillbee was a pre-war regular, who in 1913 received his dispensing qualification. His Medal Index Card records a Field General Court Martial reduction to the ranks on 1 July 1917 as a result of drunkenness. The 1st East Yorkshire Unit War Diary records total casualties for their operations between 13-17 July as: no officers killed and six wounded, but one of those only slightly so was able to return to duty; 36 other ranks killed, 186 wounded and 126 missing. William served for 303 days, but only four of those with the 1st East Yorkshire Regiment before his wounds. He was awarded the Victory and British War Medal. His childless widow, Jessie, still living at 17 Northampton Road in 1919, received a pension of 10 shillings a week, with effect from 26 February 1917. William’s younger brother Albert Edward was serving in the Ploegsteert Wood area of Belgium, as a Rifleman with “A” Company of the 21st Battalion of the King’s Royal Rifle Corps (Yeoman Rifles) (KRRC) when his brother died. Albert enlisted before his elder brother, at Kingsway Recruiting Office, Middlesex on 17 April 1915. At the time he worked as a warehouseman. He stood at 5’ 5” tall, with blue eyes, fair hair and a fresh complexion. For some reason he gave his father’s name as William Henry Hull, but CWGC information as well as other family and address details provided in surviving documentation confirms it was William George Hull. Albert served initially with the 6th KRRC, the training unit based at Sheerness, before transferring to the 21st Battalion, setting off to France aboard the “SS Golden Eagle” on 31 May 1916. He joined his new Battalion in the field on 21 June 1916. At this time they were based in and around the Ploegsteert Wood area of Belgium, not moving down to France until late August 1916. The 21st KRRC’s first significant action on the Somme occurred on 15 September when they participated in the opening stages of the Battle of Flers-Courcelette, at the start of the third phase of the Battle of the Somme. The battle is particularly noteworthy as the new British weapon, tanks, were unleashed in battle for the first time. Despite a number of early successes, including at last the clearing of High Wood, the capture of Flers, Courcelette and Martinpuich, there was no decisive breakthrough and the battle ground to a virtual halt by the 17 September due to a combination of bad weather and German reinforcements, before finally ending on 22 September. The 21st KRRC Unit War Diary records events on the 15 September. “The Battalion took part in an attack on the enemy lines in front of Delville Wood. The 124th Brigade advanced on a line which passed between the villages of FLERS on the left and Guedecourt on the right. The Battalion was on the left of the first line with the 10th Queens on the right & the 26th & 32nd Royal Fusiliers in support. The 122nd Brigade was on the left & the 14th Division on the right”. At 6.30am they commenced their attack, quickly taking without difficulty their first objective, the Switch Trench. They also took their second objective, the Flers Trench, capturing a few prisoners who showed little inclination to fight. They did incur casualties though, by getting too close to their own barrage. Lack of support on the flanks also halted their advance, so they focused on consolidating their gains. Lt Col Charles William Reginald Duncombe, the 2nd Earl of Feversham, of the 21st KRRC and Lt Col Richard Oakley of the 10th Queens (Royal West Surrey) Regiment gathered together some men to try to take the third and fourth objectives in front of Guedecourt village. They did manage to take their third objective and withstood a German counter attack, but the Earl of Feversham was killed. They were eventually forced to retreat and consolidated about 400 yards in front of the second objective, where the remnants of the Battalion remained until relieved at about 3am the following morning, 16 September. The War Diary records the following casualties for the 15 September: 4 officers and 54 other ranks killed; 10 officers and 256 other ranks wounded and 74 other ranks missing. Interestingly the initials of the officer responsible for the diary from September 1916 are “RAE” – 2nd Lt (Robert) Anthony Eden, who was appointed Acting Adjutant on 19 September. He is better known as the Prime Minister between 1955-1957, in charge at the time of the Suez Crisis. Albert Hull was amongst the wounded. His casualty form indicates 15/17 September, but from the diary it appears all casualties were incurred on the 15 September. He sustained gun shot wounds and fractures to the legs. He was transferred down the line, admitted to 1 General Hospital at Etretat, before evacuation to England on board the “Asturias” and transfer to the 5th Northern General Hospital in Leicester. This is now part of the University of Leicester. From 1837-1908 it operated as the Leicestershire Lunatic Asylum until the construction of a new Asylum in 1907. In 1911 the now empty building was earmarked as a potential military hospital. 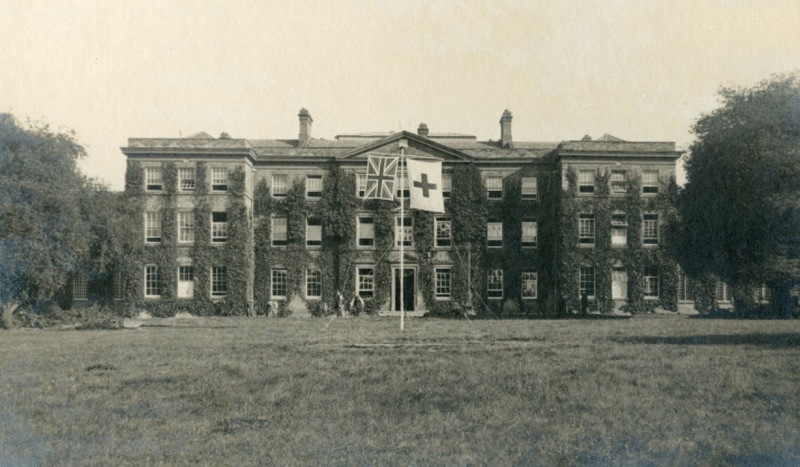 Once war broke out it became the base for the 5th Northern General Hospital. New buildings were constructed and as the war progressed it expanded to become a local network of hospitals at more than 60 locations. In total there were beds in Leicestershire for 111 officers and 2,487 other ranks, through which passed more than 95,000 casualties. 514 of these died. “….R11808 Rifleman a Hull a Coy. 21 KRR died in this hospital of his wounds this morning and next of kin advised”. Albert was buried on 30 September 1916 at Islington Cemetery in a public, shared grave. Within weeks the family were burying another son in the same cemetery. This time their third child, 16-year-old Robert. The cause of death was acute suppurative otitis media and septicaemia. In other words an ear infection. More common in children than adults, this particular infection has a number of causes, including upper respiratory infection, sinusitis, smoking (including passive), craniofacial abnormalities and allergies. Additionally, in children (usually between 3-7 years old) their developing ear structure can leave them prone to infection there when food is regurgitated. Poor sanitation, over-crowding and malnutrition are all risk factors too. Symptoms include pain, fever and earache. In Robert’s case, in this pre-antibiotic era, complications did ensue, resulting in hospitalisation and death. He succumbed to septicaemia on 18 November 1916 at St Bartholomew’s Hospital (Barts), London. He was buried at Islington Cemetery on 25 November 1916. “Perhaps you would finally look into the matter and see that the things are sent as soon as possible”. They were finally sent to the family on 21 March 1917. His were the few typical possessions of an ordinary soldier, providing memories of home, a nod to God’s protection, a little bit of cheer and an indication of his Regiment. They comprised of a linen bag, two gospels (Mark and John), a match box holder, a packet of cigarettes, a cap comforter (a knitted woollen tube pulled cap-like over the head, ideal for keeping warm or whilst on trench raids), shoulder title, cap badge (broken), letters and photographs. Albert was awarded the British War and Victory Medals. His father did query this in June 1921, asking why his son did not receive a “Star” as he joined the Colours in April 1915. He was informed he was ineligible. Albert did not actually go overseas until May 1916. The 1914/15 Star was awarded to those who who served in a theatre of war before 31 December 1915 and had not qualified for the earlier 1914 Star. So what became of the rest of the Hull family? William George died at the same hospital as his son Robert in 1925 and was buried at Islington Cemetery 27 August. The 1939 Register shows widowed Annie working as an office cleaner and living with her two unmarried children, Annie (a book binder’s assistant) and Charles (a school porter), still at 17 Northampton Road. Charles eventually married in 1941 and died on 3 January 1973, in Huntingdon. Daughter Annie never married. She died in 1974. I have not found a definitive death for Annie herself, but suspect it was 1960. I have not traced what became of Jessie, William’s widow. Survey of London: Volume 47, Northern Clerkenwell and Pentonville, ed. Philip Temple (London, 2008), pp. 1-21. British History Online http://www.british-history.ac.uk/survey-london/vol47/pp1-21 [accessed 1 May 2017]. ‘Introduction‘, in Survey of London: Volume 46, South and East Clerkenwell, ed. Philip Temple (London, 2008), pp. 3-27. British History Online http://www.british-history.ac.uk/survey-london/vol46/pp3-27 [accessed 1 May 2017]. Exmouth Market area’, in Survey of London: Volume 47, Northern Clerkenwell and Pentonville, ed. Philip Temple (London, 2008), pp. 52-83. British History Online http://www.british-history.ac.uk/survey-london/vol47/pp52-83 [accessed 1 May 2017].